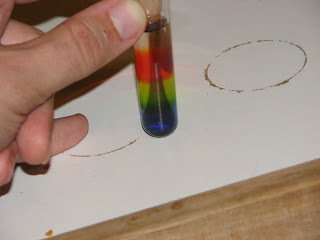 I've given away some test tubes and now for some ideas on how to use them. This is the first of those posts. Different materials have different densities. Old home chemistry books encouraged you to run to the drug store and get some mercury, carbon tetrachloride, water, oil, iron, a rubber stopper, and a cork. Pour the liquids in in order and then drop in the solids and you have a seven layer density column. This particular column is now very difficult to recreate because both mercury and carbon tetrachloride are no longer sold at the drug store. Steve Spangler has a great description of another 7 layer column that can be created from things found around the house. Now take a pipette full of the blue solution and add it to the empty fifth test tube. Now take a pipette full of the green solution and add it very carefully to the column. To do this you will need to slowly dribble it down the edge of the test tube. It should form a layer on top of the first one. Now do the same with the red layer and the water layer. It should look something like this. Amazingly it will stay this way for quite a while. The next picture is the column after 12 hours. You can see that the plain water and the weakest concentration have begun mixing. You can still see separation between the top two and bottom two layers. After another few days in the window some mold started growing on the top so I washed it down the drain. Now try playing with the solutions. Can you get them to stack in the wrong order? Can you make a solution dense enough to float a raisin in it? If you make alternating solutions of sugar and salt do they last as long as a column made from just sugar? Do they last longer? I hope you all enjoy making and playing with your own density columns. Let me know how it goes. But mold is when it starts getting interesting! Just ask Alexander Fleming.